BLOOMINGTON — The “choking game” is said to give youths a quick high without using drugs or alcohol, but with one terrifying catch. “You can die the first time you try,” Christine Hageman told teenagers who gathered after school Thursday to remember her son, Brody Hageman, who died suddenly a year ago of the practice. Even those who don’t die lose brain cells each time, she said. 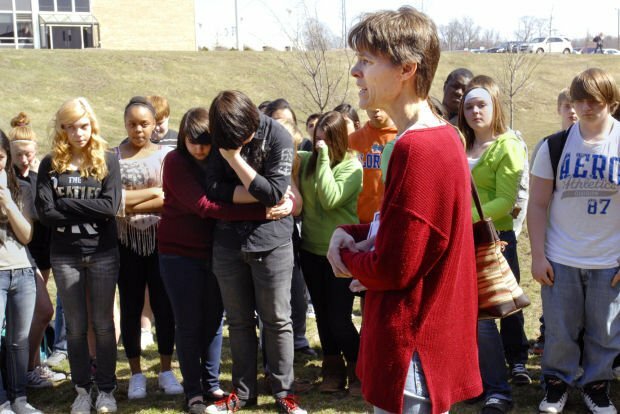 About 20 Bloomington High School freshmen crossed the school’s lawn to the nearby Bloomington Junior High School they attended last year with Brody Hageman, who was 14 at the time. With tears in their eyes, they hugged, held hands and comforted each other as a stone was dedicated to their friend in what is known as Brody Garden. On a brick wall adjacent to the garden hangs a plaque with his name and the number 5,225 — the number of days he lived. Brody Hageman died April 4, 2012, and his friends held a candlelight vigil at the school the next day. At an inquest that followed in May, a Peoria County coroner’s jury declared his death an accident. Some students may have still thought he intended to take his own life and were affected by that, Christine Hageman said, so she wanted to dispel rumors and comfort them. He never intended to hurt himself; he was looking forward to summer, she said. “Please know he loved all of you. You guys touched my heart so much,” she said. Brody Hageman was adventurous, social and active and enjoyed the outdoors and his eighth-grade friends. His mother said she didn’t notice any signs that her son was playing a dangerous game that goes by other names such as “gasp,” “the fainting game” or “space cowboy.” It involves self-strangulation or placing great pressure on the chest. “There were no signs; I never would have guessed,” she said. Later, when she read about the warning signs, she realized he did have headaches and stayed in his room, but she thought at the time “he’s a teenager” and that was typical. Parents warn children about drugs, alcohol and tell them to wear bicycle helmets, but this isn’t something students are warned about, Christine Hageman said. Brody Hageman’s friend James Alexander, a BHS freshman, helped arrange for the stone and ceremony with the aid of his parents. “I didn’t feel I had done enough; I wanted to do something more,” said James, who had been friends with Brody Hageman since they were second-graders at Oakland Elementary School. Alexander’s’ mother, Amy Alexander, led the ceremony. James Alexander read a poem his longtime friend had written. “I remember the first time Brody read that poem in poetry club; I can still hear his voice,” recalled another student. 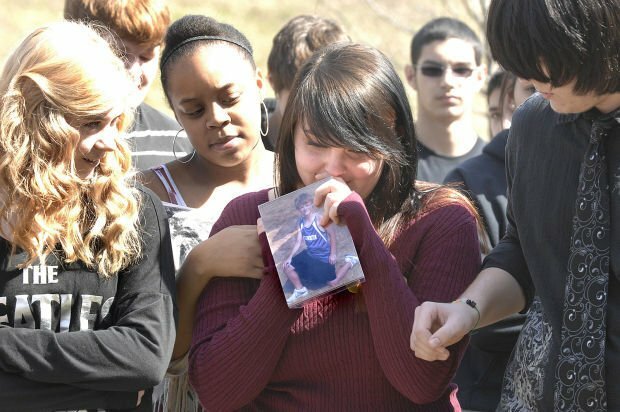 At the ceremony, Brody’s father, Todd Hageman, and wife, Heather, of Bloomington passed around a photo of his son. Each student held it and told a memory of their friend. Others said he was joyful, had a great heart, huge eyes and spunky hair. Many wore green ribbons or clothing in honor of his favorite color. Christine Hageman handed out tri-colored ribbons and pamphlets about the game. Freshman Ali Cruz, 15, hadn’t been in Brody’s Garden before even though it was planted only a few days after his death. “I didn’t have the strength,” she said. She said she finds the strength now in knowing that his organs were donated and part of him lives on. “We just love him and miss him very much,” said freshman Cearra Jackson, 16. Please take no disrespect from this- but as a pretty square fella- one who doesn't drink and who at 46 has never smoked or done any drugs at all- ever... what's the deal w/ these "highs"? Is the feeling that exhilarating and life-improving? I mean- especially given the risk- what's the appeal? I am very over-weight, so I understand addiction. But I guess I don't understand getting "high". Seems it damages and takes a lot of very wonderful people from our planet and that for something that supposedly is so appealing- it sure plagues us w/ a lot of empty sadness. I honestly don't think this was a game. people try to make themselves feel better by coming up with excuses of why things happen thats just how the world works. I think people should open their eyes and realize that they should learn to accept people for who they are instead of making someone be someone they aren't! There are MANY underlying issues around this situation that have not been addressed. open your eyes people stop being judgemental, love one another accept your friends and family for who they really are and stop pressuring someone to be someone they are not!!!!!!!! You are correct. I know the family. More to the story. It wasn't a game. His mother's more concerned about people knowing what a horrible home life Brody and Nathan had/have. That's so sad. Most of their friends were surprised his brother hadn't committed suicide as well. It's so sickening and angering that some kids have it so bad that they'd rather be dead. She can pretend all she wants. The only people that believe her garbage are people that don't know the kids or the family - so what do they matter. But those that knew Brody and Nathan, know exactly why Brody did that and it was not a game. Those that knew/know their homelife and parents, know it was no game. Pretend all you want. It's so sad. Hopefully his younger brother will grab his chance at a better life and get out of that horrible place and go to college out of state and never look back. That's his only chance. God Bless both of those sweet precious boys and I Pray He looks after Nathan. I also know the family.